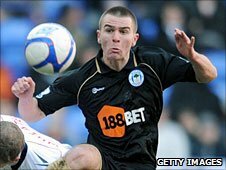 Wigan striker Callum McManaman has signed a new two-year contract keeping him at the DW Stadium until 2013. The 20-year-old has broken into manager Roberto Martinez's side this season but a head injury in January has limited him to only eight appearances so far. "Callum's a very gifted player with a natural raw talent," said Martinez. "Over the last 10 months he's developed immensely, tactically and physically - we are delighted he has now signed this new contract." McManaman is the first homegrown Wigan player to come through the ranks and play League football since England defender Leighton Baines, who joined Everton for £6m four years ago. A former Everton schoolboy, McManaman joined Wigan as an apprentice in 2007 and was offered professional terms two years later. He is a distant relative of former Liverpool, Real Madrid and England winger Steve McManaman.